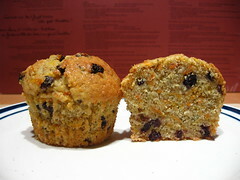 Oat Bran Carrot and Orange Muffins - Do You Know The Muffin Man? Notes: I subbed a bit of whole wheat flour for all-purpose and didn't have any nuts to throw in. Currants instead of chopped raisins. Oat bran doesn't seem to be that popular anymore, but this is a pretty good muffin.